Halsey and G-Eazy have long been couple goals on the list of many young lovers, so why did they suddenly stop being an item? Halsey and G-Eazy were the ultimate couple goals, taking the music world by storm, collaborating in hits like 'Him & I' and posting a series of adorable pictures of kissing and cuddling polaroids. When on July 3, Halsey took to Instagram to announce the breakup, half the Twitterati expressed that their faith in love had evaporated when one of music's power couples ceased to be an item, which also meant, 'in the end' there was no more 'Him & I' IRL. The world has, ever since, been speculating about the abrupt split and the news doesn't seem to die. Earlier this week Halsey broke down on stage while singing 'Him & I' without her partner while on July 9, G-Eazy was denied entry into Canada, prompting his shows to be canceled, even though the issue was with the Canadian custom, it quickly spiraled to a breakup headline. Rewind to a week ago when Halsey posted an Instagram Story announcing the breakup: "I normally keep this kind of thing private but provided our public nature I feel the need to inform my fans," she said, adding: "G-Eazy and I are taking some time apart." The 'Now or Never' singer said she wanted to dedicate her time to her art and her career but further reports on the shocking split highlights that their busy work schedules are to be blamed. 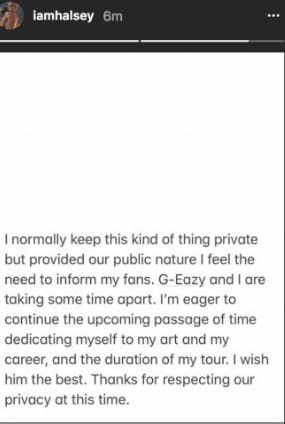 In a very recent interview, say June 29, G-Eazy told Entertainment Tonight they had been consumed with their "hectic" and "busy" schedules making it less probable to spend time together. "So much of our lives is so scheduled, you know what I mean? And hectic and busy from the travel and the performances and the interviews, and her schedule is just as busy as mine so when they overlap and we get time off, it's like, special," he said. Fans who had been following the couple closely had sensed there was trouble in paradise when the 23-year-old songstress took to Twitter to share some of the lyrics from her song 'Colors,' just a day before the breakup. Following the tweets, and all before the big announcement, pictures of G-Eazy started disappearing from the singer's profile. The next day this picture was there on her feed. No one knows what exactly went down between the two, but fans speculations have led to various conclusions; one of them is cheating and this theory is rampant on social media. Many suspects that he cheated on her because of the tweets following her breakup. On July 4, she posted a scissor emoji that fans quickly likened to his lyrics in 'Him & I,' which goes;"If I ever cheated she would try to cut my d*** off." The tweet was later deleted, only to be followed up by another cheating reference, "pumpkin eater," as the old nursery rhyme "Peter Peter Pumpkin Eater" is commonly recited as "Cheater Cheater Pumpkin Eater." However, E! reported that the main cause of their break up was their demanding career as the insider reported that the couple endured a series of "ups and downs" over the past year. The distance was getting in the way and arguments were imminent. "They both tried to remain strong to ensure their work commitments together went smoothly, but ultimately called it quits after too much fighting," the inside source told the publication. "The trust was lost between the pair when they were apart, and it got too difficult for both of them," the source added. The duo first sparked romance rumors last August, when G-Eazy surprised fans by bringing Halsey onstage during his tour in New Orleans. They jointly performed 'Him & I' on stage and kissed. Fans went gaga and social media was flooded with their pictures. A day after, Halsey took to Instagram to thank her "baby" for the performance and the rest was history. According to People, Halsey was dating the 29-year-old rapper for a bit over a year as the singer confirmed to the magazine last May. In March, the rapper gushed over Halsey in the iHeartRadio Music Awards calling her the "queen". "She's a queen. I think the world of her for real. We’re coworkers, you know? We both do this at a pretty high level, and it’s really dope to get to share that kind of experience with the person you’re actually dating,” he had said. Time and again, Halsey has been pretty candid about how the 'No Limit' rapper had pursued her relentlessly before she agreed to go out with him. She told E! News at the 2018 Billboard Music Awards, "He was just really persistent. He really wanted to hang out and really wanted me to like him a lot. It took me a while to be like, ‘Fine. Okay I like you back.'" In the world of social media, Halsey and G-Eazy were the couple all young lovers wanted to be. From taking amazing pictures and coordinating on the red carpets to saying the sweetest things about each other in interviews, and giving the world a hit song like 'Him & I,' there was no possibility that fans could fathom anything was wrong. The 'Bad At Love' singer has also sailed through all of G-Eazy's legal troubles including the one on May 3, when the rapper was arrested in Sweden. During this year's New Year's Eve, the couple gave a joint performance at a Miami nightclub packed with PDAs and G-Eazy had called the couple “2018 Bonnie and Clyde." The only problem of being a “2018 Bonnie and Clyde," is the fact that it is 2018, and all Bonnie and Clyde couples are jinxed.